How do we make care robots actually affordable for those who need them? Sunday Independent: Ireland has emerged as one of the world's top five medical technology hubs over the last 20 years. Thirteen of the top 15 global medtech companies have bases here. Immedis, a subsidiary of the Irish owned Taxback Group, has announced 80 new roles today in their offices in New Jersey, Dublin and Kilkenny. One sector that could make gains is the construction products and services industry. Enterprise Ireland's Marina Donohoe says the Northern Powerhouse offers opportunities. Hospitality platform SwiftComply shrugged off competition from nine other Irish start-ups to emerge victorious in the qualifier to represent Ireland in the Startup World Cup. The growth of the aviation and aerospace sector has been driven by the unique strengths Irish companies offer, including a highly-educated and adaptable workforce. Two Irish start-ups have beaten hundreds of companies from around the world to win a place on the prestigious Blackbox Connect accelerator programme in Silicon Valley, California. Irish customer support software firm, VoiceSage, has signed a contract potentially worth $40million with Middle East-based firm, Mobility MEA. Funds managed by ACT Venture Capital, as well as clients of Dublin-based Signature Capital, have stumped up the bulk of €3m in funding that has been secured by Irish tech firm Ocrex. The Smart Group is a specialist in providing marketing services to firms involved in everything from retail and pharma to technology and government services. BMS Finance is investing in Anam Technologies to help the Dublin-based company with its international expansion plans. Innovative software which can be used to analyse the nutritional composition of food and devise healthy meal plans is now being sold in 140 countries by Dublin startup Nutritics. “If you can’t stand up, stand out” is the motto of two Galway sisters Ailbhe and Isabel Keane, who are transforming the image of wheelchairs into “a piece of fashion and self-expression” with their colourful and zany wheelchair covers. 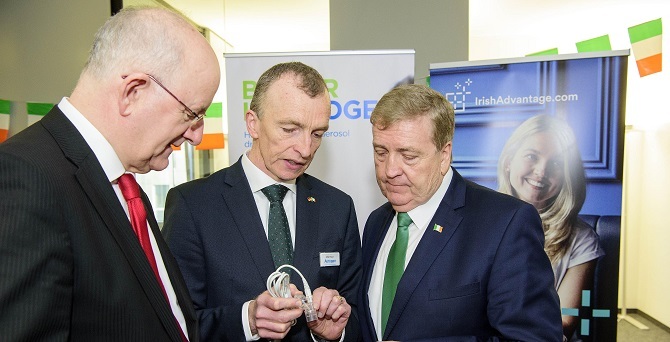 The Kildare-based company was crowned Exporter of the Year, with Broderick's Brothers taking home the award for High Potential Exporter, sponsored by Enterprise Ireland. Enterprise Ireland client Veri was named winner of Google’s Adopt A Startup 2017 Autumn Programme, following a dragon’s den style final held in Google’s EMEA Headquarters in Dublin. Galway start-up, Tr3dent, has raised $350,000 in seed funding to accelerate the adoption of its business ecosystem modelling technology.